We use lean, easily digestible duck because it is a tasty, novel source of protein for dogs. 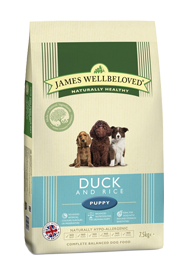 James Wellbeloved Duck & Rice Kibble is a pure, natural, complete dry food which uses organic oats as a source of fibre. Seaweed, alfalfa and yucca are also added for the health benefits they bring. Ingredients: Rice, duck meat meal, organic oats, duck fat, whole linseed, duck gravy, alfalfa, sodium chloride, natural seaweed, chicory extract, calcium carbonate, lysine, D,L-methione, yucca extract, threonine, JWB special ingredients. Contains: Minimum 27% duck, min 27% rice, min. 7.5% organic oats. Typical analysis: Protein 30%, oil 15%, fibre 3%, ash 7.5%, omega-3 fatty acids 1.1%, omega-6 fatty acids 2.8%.